Transporting a motorbike is an everyday occurrence for some riders however it’s not always something that goes right. Whether you’re loading onto the back of a pick-up or into a van, going up ramps and into small enclosed spaces isn’t easy and can result in dumped bikes and damage. And if you damage your bike, you might have to claim on your motorbike insurance, so it’s best to be avoided. 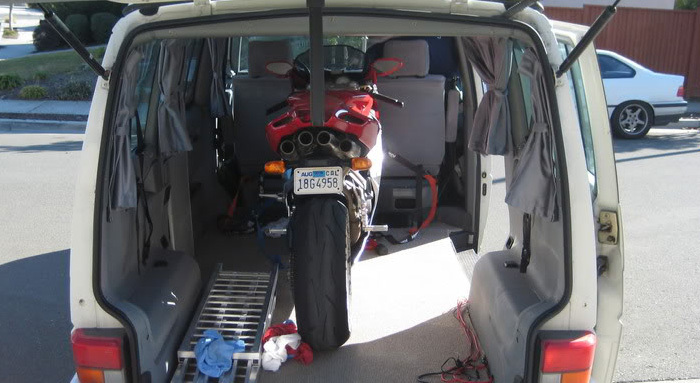 Trackday riders will often transport their bike in a van or trailer because a full day at a circuit can be tiring and the prospect of a long ride home is not appealing. Others transport their motorbike because they want the option of riding as well as driving. Bearing in mind that your motorbike isn’t cheap and that repairs can be costly, you don’t want to leave anything to chance when transporting your bike. As well as getting a weighty motorbike up and into the back of a van or trailer, you then need to hold it still and make sure it stays still for the duration of your drive. 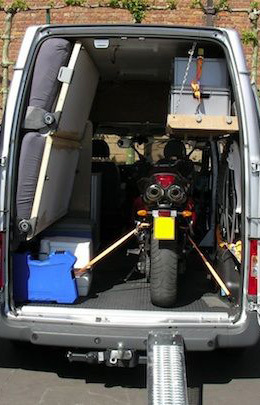 Trailers and vans will both pose similar problems when getting your motorbike onto or into the back of them however they offer different advantages. Trailers are generally lower to the ground and will provide more options for tying your bike up than a van, they’re much cheaper too. However a car pulling a trailer is restricted by speed and can’t travel in the outside lane on a motorway. Vans offer much more protection from the weather than a trailer and there’s not the worry of leaving your bike behind you on the road if your trailer comes loose. Vans are also much more manoeuvrable and can drive as a normal car can on motorways. Strong rope will suffice if it is used properly however it’s best not to scrimp when it comes to securing your bike. There are specially designed and manufactured motorbike ropes and ties that will help keep your bike upright when you’re transporting it. As well as being strong, these ropes and straps come with mounting hooks at either end that can usually be tightened or loosened using clutches. While strapping your motorbike down is obviously important, one of the biggest difficulties and riskiest parts of transporting your bike is getting it up into a trailer or van. Two people can lift some bikes and both should stand either side of the bike at the front end. The person on the left hand side should put their left hand under the left fork leg with their right hand on the left handlebar. The second person does the same but it’s their right hand under the right suspension fork and their left hand on the left handlebar. Both people should lift the front of the bike (using a correct lifting technique) and place the front wheel on the back of the van or trailer. Once the front wheel is resting on the back of the van or trailer, one person should get in the van, put the bike into first gear and hold the handlebars. The other should move to the back of the bike and lift the rear of the bike by holding the wheel itself (in gear it shouldn’t move around). It can then be rolled into the van or the trailer. For some bikes, strong wooden boards will suffice however custom-built ramps are much more effective. As well as providing more grip and traction for the motorbike’s wheels, they will normally have a lip to connect to the edge of the van or trailer. This means the ramps should not disconnect from the van or trailer as you are moving the bike up it. Again, two people are better than one and both can guide the motorbike as it goes up the ramp. One person can do it on their own by driving up a ramp, however it’s a risky act: go too slow and the bike will topple off either side of the ramp, go too quick and you’ll end up in your van’s driving seat or out of the other side of a trailer. Once your motorbike is up and inside your van or trailer, most of the hard work is done however one of the most important jobs remain. You must secure your bike properly to prevent it from falling over in transit and ultimately damaging it. As logic implies, if your bike is lent against the side of your van or trailer it can only ever fall one way. If you lean your bike against the side of your van or trailer you should point your front wheel in the opposite direction and the handlebars and foot pegs are the only part of your bike that should touch the wall. The straps should be secured with a floor mount and that should then be strapped around an unmoving part of the bike, like the footrest hanger. These straps should then be tightened to ensure that the bike will not wobble or potentially fall over during transit. Both sides of the bike should be strapped down and there should also be some strapping to prevent the bike from moving backwards as well. Your bike can also be strapped down in the middle of the trailer or van. Again, push the front wheel against the front wall of the van or trailer and use straps to secure it into place – these straps should come from both sides and the front. The bike should be tied in a way that all straps are pulling the bike forwards slightly, again to prevent the bike from moving backwards. The front brake should be applied if possible by using an elastic band or string. This should stop it moving about when the van or trailer is slowing down or accelerating. Straps should be fastened while the front suspension is compressed to prevent it bobbing up and down in transit. Rear suspension should also be compressed when tying it down.